Reverend Founder Joe Naylor has been on a quest to meld a solid body’s sustain and attack with the rich, big tone of a semi-hollow. 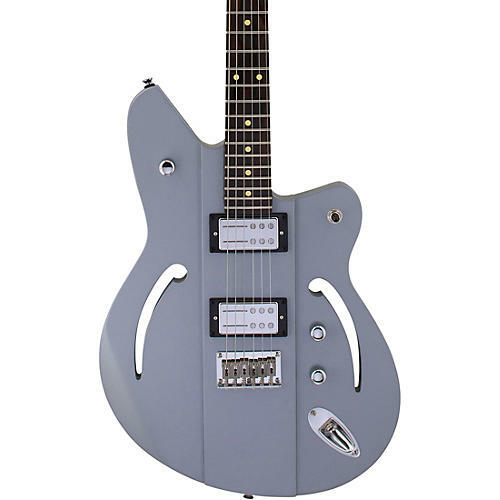 Naylor’s sonic dream is now a reality with the introduction of the Reverend Airsonic. Radically thinner wings and thru-body f-holes allow the body to resonate intensely, while a thick center ridge establishes solid sustain. Harmonics shimmer, single notes sing, and power chords ring like a bell at stage volume. Add in overdrive, and the controllable feedback is a thing of beauty. With the forearm and stomach contours, this guitar is light and comfortable. The Airsonic HB’s Railhammer Hyper Vintage Humbuckers tighten the lows and fatten the highs, and a flat mount string-thru body bridge offers even more sustain. If you’re ready to make a unique visual and sonic statement, the Airsonic HB is a great choice.